Starting an exercise program can be a daunting experience. A visit to your local gym can seem very intimidating. You look around and are dazed by the array of machines and exercise equipment. What is it? How dose all this stuff work? Even the vocabulary seems like a foreign language. In this article I am going to explain some of the most common pieces of exercise equipment and workout accessories that you will find in a gym. There are basically two types of equipment that you will find in the gym - free weights and machines. Free weights are the most basic form of bodybuilding equipment. The reason they are called "free weights" is because there are no attached pulleys, cables, pins, or weight stacks. They consist of barbells, dumbbells, and weight plates. The barbell is a long iron bar that is between 4 and 7 feet long on which weight plates and placed. Barbell exercises are performed by holding the barbell with both hands. At the top of the list are Olympic barbells. They are 7 feet long and weigh 45 lbs. These are heavy-duty bars that can handle huge weight loads of over 800 lbs. Some Olympic bars can handle weight loads of over 1000 lbs. Because they are so big they are used mostly for heavy basic exercises such as bench press, squats, and dead lifts. Many gyms also have a barbell rack that has an assortment of fixed weight barbells. They usually have barbells that are from 20 - 100 lbs. in increments of 5-10 lbs. (i.e. a 20 lb. bar, 30 lb. bar, 40 lb. bar, etc...). Besides Olympic barbells, there are standard barbells. These are the types of barbells that you will see for sale in most department stores. They are 1 inch thick and usually 5-6 feet long. These are ideal for a home gym setting. A dumbbell is a short barbell, usually 10 - 15 inches long. Dumbbell exercises are performed with a dumbbell in each hand. Most gyms have a dumbbell rack that has an assortment of fixed weight dumbbells. They usually have dumbbells from 5 lbs. - 100+ lbs. in increments of 5 lbs. (i.e. 5 lb. dumbbells, 10 lb. dumbbells, 15 lb. dumbbells, etc...). There are also adjustable dumbbells that have small collars that clip on the ends of the dumbbells to hold the weight plates. 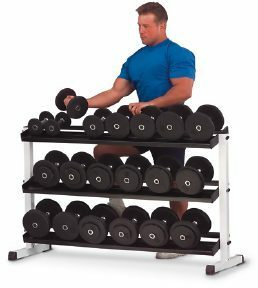 While they are not a convenient as a rack of fixed weight dumbbells, they are much cheaper and take up less space. They are ideal for a home gym setting. Weight plates range from 2.5 lbs. to 100 lbs. They are usually iron, however, many home gyms have plastic weight plates. 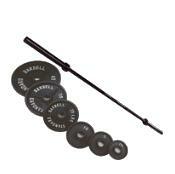 Many people are familiar with the York Plastic Barbell Set. While this is ok for someone who is just starting out, the thickness of the plastic weight plates limit the amount of weight that can be placed on the barbell and dumbbells. All weight plates found in commercial gyms are made of iron. There are two types of iron weight plates - Olympic plates for the Olympic barbells and standard weight plates for the 1 inch thick standard size barbells. 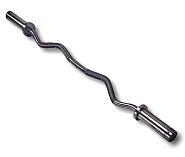 The EZ curl bar is designed for working the biceps and triceps. It is a shorter then a barbell and has angled hand placements. This is good for working the muscles from different angles and reducing the stress that a straight barbell can place on the wrists. This is an oval shaped bar that has two parallel hand placements. Even though it is called a tricep bar, you can use it to work other bodyparts besides the triceps. Similar to the EZ curl bar you can use it to work the muscles from different angles and it can reduce the stress that a straight barbell can place on the wrists. The most common piece of equipment in any gym is the bench. There are three types of benches - flat, incline, and decline. Some benches are adjustable (i.e. they can be adjusted to either flat, incline, or decline). Some benches have racks on one end for holding a barbell, while other benches do not have any racks. 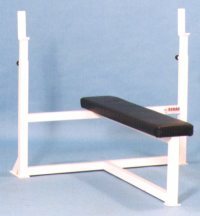 The benches that do not have any racks are generally used for dumbbell exercises. This bench is used for working the lower back, hamstring, and glute muscles. 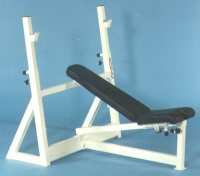 Some gyms have a hyper extension bench that can also be used for sit ups to work the abdominals. This bench is designed for working the biceps. It has an angled pad that you you're your upper arms on. This pad prevents you from swinging the weight so you can isolate the bicep muscles. 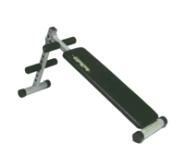 The arm blaster is a two foot long, 6 inch wide, flat, curved metal bar. There is a strap that goes behind your neck to hold the metal bar is flat across your mid section. It works similar to a preacher bench by eliminating body momentum and allows you to isolate the biceps. 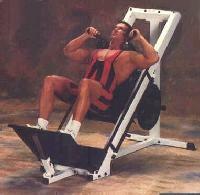 This is basically just a decline bench that is used for doing abdominal exercises. 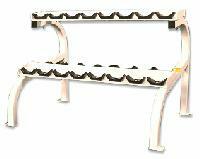 It has rollers that you hook your feet into so you do not slide off the bench. Any exercise that you would normally do on a bench can be done on the stability ball. You can do exercises like bench press, dumbbell flyes, shoulder press, lateral raises, pullovers, crunches, reverse crunches, etc... This is an excellent piece of equipment. The ball can move and roll so it increases your balance and strengthens the small stabilizer muscles. This is a set of parallel bars. Dips are a great exercise for working the chest, shoulders, and triceps. The chin up bar is a iron bar that it either bolted to the wall or part of a exercise machine (i.e. the power rack, universal multi-station, etc.). Chin ups are great for working the back, biceps, and forearms. There are several different types of rack found in the gym. 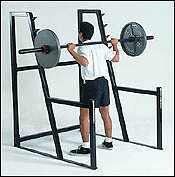 There are racks that are used for storing weight plates (also called weight trees). There are racks for storing barbells, dumbbell racks, etc. 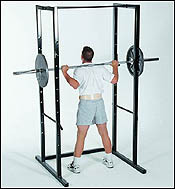 There are also racks for doing exercises such as the power rack or squat rack. There is also a special rack/machine called the smith machine, which is a combination of a machine and free weight barbell. 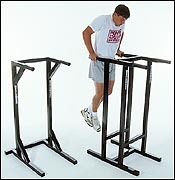 Machines allow you to perform a wide variety of exercises. Some machines are designed to work individual muscles, while other machines consist of a multi-station that works the whole body. Most home gym machines are multi-station machines because they are much cheaper and take up less space then having different machines for each muscle group. Machines have advantages and they have disadvantages. They are generally easier to use and safer then free weights. But free weights tend to stimulate more muscle because you have to use more stabilizer muscles in order to balance the free weights. The best situation is to include both free weight and machine exercises in your workouts, this way you can get the best of both worlds. While many, including myself, believe that squats are the best overall leg exercise. 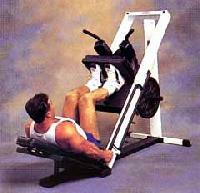 The leg press is best machine leg exercise. 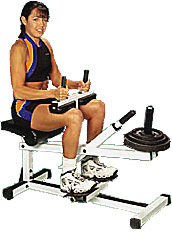 Most leg press machines are set on a 45 degree angle. 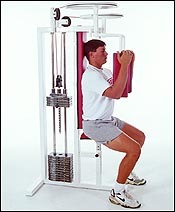 With the leg press you can safely lift heavy weights without worrying about slipping or falling. It places less stress on the lower back and knees then squats. This is a good variation of the traditional barbell squat. This is good for developing the outer sweep of the thighs. This machine is excellent for isolating the quadriceps muscles. Many people like to use this exercise for pre-exhausting their quadriceps and warming up the knee joints before moving on to squats or leg presses. 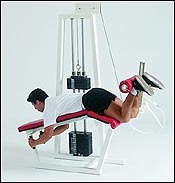 This machine is one of the best hamstring exercises. 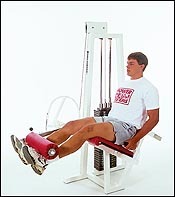 Some gyms may have a leg extension and leg curl machine built into one machine, like in most home gym machines. 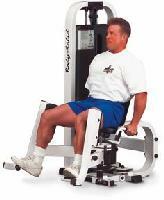 There are two types of calf machines - standing calf raise, and the seated calf raise. The standing calf raise targets the upper calf muscles (gastrocnemius) and the seated calf raise works the lower calf muscles (soleus). 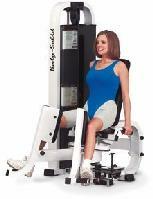 This machine works the inner thighs (adduction) and the outer thighs (abduction). 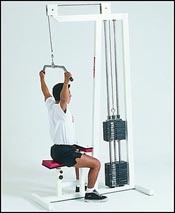 Some gyms have two separate machines for adduction and abduction, while other gyms will have both exercises combined into one machine. This movement is similar to a chin-up. While many believe that chin-ups are superior compared to the lat pull down, they have one major restriction. The user has to be able to lift their bodyweight. Many people are not strong enough to effectively work their backs with chin-ups, so the lat pull down is a great alternative. 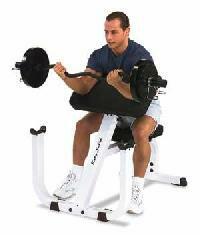 This is a great machine for isolating the pectoral muscles (chest). 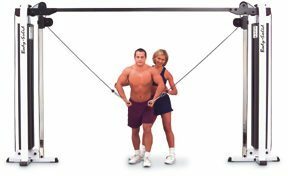 Some pec decks have two vertical arm pads that you place your forearms against, while others have handles that you hold in your hands. Most gyms have an assortment of cable and pulley machines. Usually there is a weight stack that is connected to a long cable that has a small handle or bar at the end. You can perform exercises for your entire body utilizing pulleys. Weight lifting gloves can protect your hands while working out. If you have not worked out before you may get blisters, which will be replaced by calluses overtime. Whether or not you use gloves is personal preference. 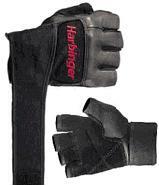 For about $15 you can get a pair of weight lifting gloves in most any sports store. Elbow, knee, and wrist wraps are common in the gym. People may use these if they have an injury or sore joints for added support. 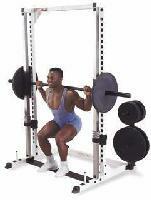 Many power lifters wrap their knees when doing heavy squats. If you do not need wraps it is best not to use them. Overtime they may cause your joints and surrounding muscles to become weaker because they are being supported by the wraps. However, if you do develop sore joints you can use elastic wraps. This will help keep the area warm and provide extra support while giving your joints a chance to heal. Wraps are available at most drug stores for about $10 - $20 depending on the type of wraps. This is a basic bodybuilding accessory. The purpose of a belt is to provide protection and support for the lower back. It is best to save the weightlifting belt for when you need it, you shouldn't wear it during your entire workout. Use it for heavy squats, dead lifts, heavy rowing exercises, etc. Overuse of a weight lifting belt may weaken the lower back because the muscles are always supported and do not get a chance to be worked like the rest of the body. Weight lifting belts are available at most sports stores, the price can vary depending on the type of belt, but a good belt is approx. $40 - $50. 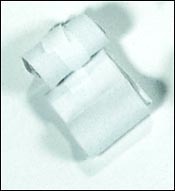 Wrist straps are short, narrow pieces of strong material (usually about 20 inches long and 1 inch wide). They are wrapped around the wrist and then around a barbell or dumbbell to improve the grip. Wrist straps are most commonly used for exercises such as dead lifts, shrugs, chin ups, and heavy rowing exercises. They prevent a weak grip from limiting your workout poundages. Overuse of wrist straps can cause the muscles of the forearms to get weaker. It is best to save them for when you really need them (i.e. on your heavy sets of dead lifts or shrugs). Do not use wrist straps for your warm up sets. Wrist straps are available at most sports stores for about $10. This is a leather harness that fits around the head and has an attachment for a weight at the end. Head straps allow you to work the muscles of the neck. Most bodybuilders do not do direct neck exercises because heavy shoulder and back work will also work the neck muscles. However, if you neck development is lagging behind you can get a head strap and do some extra work. This should be available at a sports store, but you may have to order one because it is not as popular other accessories. Many bodybuilders like to use chalk to dry the sweat on their hands. Olympic weight lifters, power lifters, and gymnasts all use chalk. It comes is small blocks and is available at most sports stores for less then $10. Some gyms do not allow the use of chalk so check with your gym's policy before you bring along chalk. FREE FAT LOSS REPORT reveals the little know fat-melting secrets of the world's best natural bodybuilders and fitness models. Click here to find out how to lose fat quickly and easily without drugs or supplements and get as lean as a bodybuilder or fitness model. Click here for more info.